I am a big fan of road-pricing. You can read previous posts about the concept. The basic idea is that roads are a limited resource and should be priced accordingly. Driving during peak-hours would be charged at a higher rate than driving off-peak. Road pricing has been proven all over the world to help control congestion. Also, the revenue from the pricing should be reinvested back into maintaining our current infrastructure and building transportation options. "At the end of the day we have to come up with the funding somewhere," Prendergast said. "It's more than about transit. It's about changing some behaviours. You drive down Hastings, Lougheed, Kingsway ... they're all crowded. The days of the free ride for automobiles worldwide is coming to an end." Surrey Mayor Dianne Watts said road pricing could work as long as it's done with a policy in place and plans to build up the transit system. Right now, there aren't enough buses to support Surrey residents, she said, let alone another million people moving into the region by 2040. "The vehicle levy, is for me, unsupportable," she said. "There's no way I can go out to our residents and say, 'You're not going to get anything, but pay an additional property tax and a vehicle levy. You might get a bus or two.'" The Salmon River Uplands shall be maintained for rural residential and agricultural uses. A more detailed plan will be prepared setting out policies for future growth, subdivision and agriculture in this area. I stand to be corrected, but I believe that a plan has not been developed for Salmon River Uplands. I know that once that plan start to be developed, it will be controversial. I foresee a debate between keeping that area rural verse suburban development. The other area of interest is Gloucester Industrial Estates. This area was removed out of the ALR in 1978. The unfortunate reality of Gloucester is that it will probably never see effective public transit due to its isolation. On the bright side, it does have direct access to Southern Rail and the US Border, giving it better transportation options than say the Campbell Heights Industrial Area. The Township of Langley has very little developable land. It behoves Township Council to ensure that it develops in a sustainable, transit-friend way. For those of you that are following, I've been having a hard time getting information about ALR in the South Fraser. The Agricultural Land Commission would not give me any information, forcing me to send in a Freedom of Information Request last week. I also contacted our local governments. I do have to say that Surrey has the most information on the ALR and farming in general online, so hats of to Surrey. I'm very disappointed with Delta. They ignored my emails and have their farming plan only available for viewing at their municipal hall. Very odd for a community that bills itself as farming central. The Township of Langley has good information online as well. The ALC website has this to say about the Township's Rural Plan. In July 1993 the Council of the Township of Langley adopted the Langley Rural Plan. The Plan was a breakthrough document. Compared to other land use plans, the Langley Rural Plan was far more responsive to agricultural issues. At several points the plan was extremely innovative and its contents, goals, objectives and policies, as a package, were far more comprehensive than any other official planning document applied to the ALR up to that time. I had forwarded your email to our GIS & Demographics person... He followed up with me to let me know that we do not track this information directly, we get it from the Commission, since they make the ultimate decision on exclusions. They provide this information to all Municipalities, so he suggested that you contact them directly. When I think about the pending doom of TransLink, I often wonder if its creation had more to do with urban/rural politics than anything else. BC, like many places in North America, has an urban/rural divide. It is clearly evident in transportation policy throughout the history of the province. From the "Wacky" Bennett era of highways, BC Ferries, and BC Rail; to SkyTrain and the Coquihalla in the 1980’s; to the Island Highway in the 1990’s; and the Gateway Program and TransLink this decade: It seems that every project has been controversial. It was a common complaint (I heard growing up) that the province could not afford to paint lines on the road in the interior, but Vancouver got gold-plated transit. When the province created TransLink it basically did two things. 1.) Absolved the province of any responsibility for transit, deflecting any criticism back to the region. 2.) Gave the appearance that the province wasn’t taking all the hard-earned money from someone in William’s Lake and spending it in Vancouver. This is important because people in rural BC have more MLA per capita than urban British Columbians. In 2008/2009 the province covered 36% of BC Transit's (transit for everywhere but Metro Vancouver) operating costs and 0% of TransLink. Given the fact that the TransLink service region covers about 50% of the population of BC, would it not make sense for the province to cover 36% of TransLink's operating costs? The mayors of the communities that TransLink serves are ready to do unpopular things like introduce a vehicle level. It is not time for the province to step up to the plate? From the perceptive of rural votes in BC, it could see how it could be a bit of a political hot potato to give “even more money” to Vancouver. But if you look at the BC budget and economy today, urban BC is supporting rural BC. According to the BC government the role of resource industries is declining. They currently employ about 9% of British Columbia's workforce. In fact revenue from resources account for about 12% of all revenue collected by the province. The province gets more money from BC Liquor and BCLC than the forestry sector! It is time to put rural/urban politics aside, and give back Metro Vancouver funding for transit. It’s hot outside, way too hot to blog. So, I will keep this brief. South Fraser OnTrax received a letter from the City of Langley over the weekend. The City has donated the use of the Douglas Rec. Centre for our community workshops that we will be hosting this fall. The Township of Langley gave us a grant of $2,500, plus the use of the Presentation Theatre at the Municipal Hall earlier this year. It is great to see that both the Langleys supporting our workshops on building a sustainable Langley. You can donate to us at anytime by using the Paypal buttons on the right column of this blog. South Fraser OnTrax has sent a letter to Mayor and Council in the City of Langley on the new Park Avenue Development. You can download the letter from the Document Archive. Well, it looks like the drama with TransLink funding continues according to an article at BCLocalNews.com. They emerged from a closed-door meeting with TransLink directors Wednesday vowing to press the provincial government for more money to finance the region's transit expansion plans. What was interesting to read was the mayors' willingness to look at the vehicle levy. Of course even with TransLink tapping out their current funding sources, it will still fall short of the $450 million that TransLink is seeking. I like what the Mayor Peter Fassbender said. "The public wants improved transit service," Fassbender said. "They want us to reach our environmental goals. They want to build for the future. They want communities that are sustainable. "We represent a significant population," he said. "For the government to say we're not going to sit down and find a way to get there would be bordering on stupidity." He is right. Metro Vancouver holds 48% of the total population of BC on 0.3% of the total area of the province. Of course the Province is still saying that there will be no new funding for TransLink from them. I (and many others) will not be a happy camper if transit services are cut next year. It would seem to me that the only bargaining chip that the mayors and TransLink have is the construction of the Evergreen Line. On a side note, even after TransLink was restructured to a “professional board”, they still don’t have the funding they need. I remember the former Minister of Transportation saying that the new TransLink will be able to get more things done. One thing the new TransLink has done is bang the lack-of-funding drum even louder. I wonder if TransLink might be "restructured" again. I hope not. I hope that this funding situation gets resolved, so people like me don’t get left out in the after math. I overheard an interesting conversation on the 595 bus the other day between Walnut Grove and the West Coast Express. Two business types where talking about whether it made sense to drive to the West Coast Express or take the bus. They didn’t like the bus very much (lack of Air Conditioning, etc.) which didn’t surprise me. The two people decided to take the bus because of the toll, plus parking at the WCE station would "add up pretty quick." There are two lessons to be learned from this little story. First, most middle and upper income people will not take a bus and do not like buses. They will, however, ride rail based transit. Second, tolling and paid parking affects people’s travel patterns. What does this mean for the South Fraser? First, we need to get building light rail now. If we ever want to shift people in a meaningful way to transit, the bus ain’t gonna cut it. As was proven in the last US election, people in eight major city actually voted to tax themselves for light rail. Second, the region must look at congestion tolling and parking pricing measures to encourage people to think about taking the transit that is available. Of course, we need to build the transit before we start pricing. It was interesting to read an article in the Georgia Straight about the province’s refusal to help TransLink. However, to the disappointment of mayors like Port Moody’s Joe Trasolini, B.C. Transportation Minister Shirley Bond has said that TransLink has to make do with its current funding sources. Last month I blogged about my travels on the West Coast Express and how it didn’t save me any time. Well, I must admit that I was partially wrong. Yesterday afternoon I was trying to kill time because I had a 6:45pm appointment in Downtown Langley. Normally, I leave work at 4:15-30pm and get to Langley Centre at 6:15-6:30pm. I thought I would take the West Coast Express to kill time and enjoy the air conditioning and comfortable seats. I got to Langley earlier than I normally do. I ended up leaving Waterfront Station at 4:50pm and getting to Langley Centre at 6:10pm. That’s a time savings of 40min! Anyway, it was interesting seeing the people on the 595 from Maple Meadows Station to Walnut Grove. I’ll just say that there was more people in snappy business outfits than I normally see on the bus. TransLink should really be selling transit service between Walnut Grove and Maple Meadows station given the fact that a larger than average amount of people in Walnut Grove work in Downtown Vancouver. The 595 was basically empty after it stopped in Walnut Grove. Well, I’ve sent in my Freedom of Information Request to the Agricultural Land Commission (ALC), so now they have 30 day to reply to my request. While doing some research about the ALC and agriculture in the South of Fraser, I seem to have hit a brick wall when it comes to information. If I didn’t know better, I would think that the government is trying to hide something with the lack of information out there on the agricultural land reserve (ALR). The Township of Langley had some information that they sent me, based on 2000 data, and they were the most responsive to my information request. The City of Surrey has more stats on agriculture and the ALR online compared to Delta or Langley, though it is based on 2004 data. I received an email last week from the City of Surrey letting me know that someone would get back to my request. What shocked me the most is the limited about of data on agricultural land in Delta. While both the Township of Langley and Surrey have agricultural information online and easy to find, it appears that in Delta, mum’s-the-word. Any agricultural information I was able to find online in Delta was buried within the Official Community Plan (OCP). When I contacted the Corporation of Delta to get information about the agricultural land, I was told that their agricultural plan was only available for viewing at their municipal hall. Why isn’t this online? Also, when I asked about ALR information, I was told to contact that ALC, and that they knew nothing. When I asked if their stats on the ALR in their 2005 OCP was updated to 2009 information, I was promptly ignored. What do they have to hide in Delta? The lack of information on farming is odd in the community that bills itself as farm central. While there is agreement that commercial uses should be included at the southwest corner of 80 Avenue and 200 Street, staff feel that the timing of a major and stand-alone commercial development in this location is premature as there is not enough population in the neighbourhood to support such a development. Furthermore, staff believe that commercial uses should be: a) phased in conjunction with other (residential/institutional) uses in the SNP area; b) serve the needs of the local Jericho sub-neighbourhood plan area primarily; c) not compete with, or impact the viability of, other neighbourhoods; d) form part of a mixed use (inc. market housing) development project; and e) not be reliant on traffic along 200 Street. Experience in the Township has demonstrated that residential development in the desired form will not necessarily follow the less challenging commercial development. It is in fact through specific and strategic policies that community commercial centres, such as Walnut Grove, were able to establish and grow. Sustainable development principles support commercial development in locations that are designed for the neighbourhood not passing traffic and are central to the population to reduce dependence on automobiles. This has the benefit of creating communities based on strong, resilient neighbourhoods and not simply commercial districts dedicated to automobile access. Given the relatively small existing population in the area, the concept of a stand-alone commercial project exceeding the recommended 5,000 ft2 maximum floor space would appear to mainly capitalize on the exposure provided by 200 Street rather than acting as an anchor for the neighbourhood’s local commercial needs. At today’s special council meeting, developers from Vancouver asked that commercial-only development be allowed on this section of 200th Street. Without providing mixed-use, this area may be doomed to auto-centric congestion. Without mixed-use development, providing high quality transit becomes next to impossible. With this kind of commercial development going forward, we won’t see sustainable development in this section of 200th street until sometime after 2030! Councillor Bateman, Richter, and Ward all opposed allowing stand-alone commercial development though it looks like these Vancouver developers will be getting their way at the expense of the people of Langley. 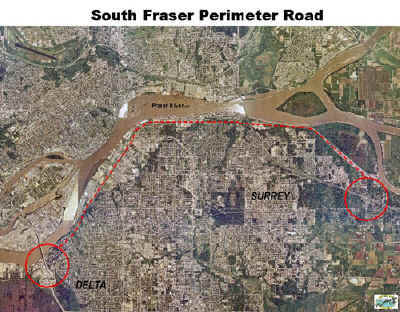 Before the South Fraser Perimeter Road went through Burns Bog to Deltaport, from 2000 to 2003, it was planned to go from Highway 91 to Highway 15. Thanks to the Way Back Machine, I found the old site for the SFPR. I suggestion you check out the full web page, but here are some highlights. The goal of the SFPR Planning and Preliminary Design Study, as defined in the Ministry of Transportation’s (MoT) Terms of Reference, is to "determine the most viable alignment for the corridor between Highway 91 and Highway 15 for a high standard (80 km/h) four lane facility with accesses restricted to appropriately spaced and located signalized intersections which in the long term are proposed to be converted to interchanges". So in exciting news, it looks like there will be a new development in Downtown Langley on Douglas Crescent and Park Avenue. You can read about it in the Langley Advance and Langley Time. I wanted to point out a few interesting facts. Park Avenue will be closed. This is important because it was also part of the Spirit Square Design Process. It was envisioned to see the West/East running part of Park Avenue terminate into a mini-planted traffic circle. Also, it was envisioned that there would be a pedestrian-access commercial facing the park. I’ve placed a call into the City, but based on the information released to date, it appears that this new development is not mixed-use. This is similar to the development at the corner of Fraser Highway and 201A Street. South Fraser OnTrax was disappointed that this development was not mixed-use. -Retention of historic Federal Building located at the corner of Douglas Crescent and 204th Street. I can understand why commercial development isn’t big on the City’s priority list, but I believe that the City should allow for highly successful live-work units. I am happy that the parking lot will be put to a better use. Update 9:06pm: It has been confirm that this is a residential only building. There is no electronic version of archived decisions earlier than those posted on the website. You would have to view individual hardcopy files to see decisions from 1998 to 2005 and that would involve retrieving hundreds of files from our file stacks and from offsite storage. The scope of this work is well beyond this offices ability to resource. So I've now mailed in a Freedom of Information Request on the advice of some my friends in the news department at the TV station I work for. Depending on how the request goes, it might even become a story. I find it strange that ALC information seem to be hard to come by considering I can get information from the Township of Langley’s website that goes back until 1992. I’ll keep you posted on this information finding adventure. Smart Growth America released a report on the first 120 days of stimulus spending and sustainable transportation. Check it out. Not surprising, most money went to roads. So, I was reading the South Coast British Columbia Transportation Authority Act and came across this interesting section about the major road network. 21 (1) Despite the Community Charter, the Vancouver Charter or any other enactment, a municipality must not, without the approval of the authority, take, authorize or permit any action that would reduce the capacity of all or any part of the major road network to move people. I was also under the impression that once a road was placed into the major road network, you couldn’t remove lane capacity for vehicles. It is encouraging that the act says people. That mean that on 200th Street, the Township of Langley could remove a general purpose lane and make it into a rapid transit lane because you would actually be providing more capacity to move people. Never mind that LA’s infamous air slapped millions with allergy-like symptoms. People didn’t want to accept that their lifestyles-their dual cars, their electricity sucking kitchens- shared any blame. They also did no think they should have to pay much or suffer any minor reduction in range or performance to reduce air pollution, and when called upon to do so, many Californians… could get very childish. So last week, I finished reading the book Smogtown: The lung-burning history of pollution in Los Angeles. And I finished reading it at the perfect time because a lot of what the book talks about is also the Vancouver experience. The book basically looks at the history of smog-fighting in—and therefore, the history of—LA. Anyway the point is that, just like Metro Vancouver, people in LA are willing to have other people change for the sake of the environment, but personal lifestyle change is must harder. We know that 2/3 of all green house gases come from our homes and vehicles, yet very little has changed in improvements to home efficiency and transportation patterns. It is a bit depressing to thing that even with thick pollution, people in LA were resistant to change. It makes me think that it will be much harder to get people to change over something that is less visible in our daily lives, like global warming. Now what does the Burrard Bridge have to do with this? While the change in road space allocation on the bridge really isn’t going to do too much for the environment, it sends a big message. (The City of Vancouver has been reducing auto road space in Downtown Vancouver for years. In fact auto use is something like the number 3 choice for transportation.) Our lifestyle must change and we will help you by giving priority to sustainable transportation. In other news, last year the Township of Langley council heard from a light rail expert about making Langley a light rail centre of excellences. Well, it looks like the people in the state of Oregon are already doing that. Because most railcars are almost entirely produced overseas, other countries have been enjoying the economic benefits of America’s booming transit ridership with new light rail and streetcar lines opening from coast to coast. That began to change today in Portland, as the first American-made streetcar in almost 60 years was unveiled to the public. The streetcars are made by United Streetcar LLC and their parent company, Oregon Iron Works. It has been a busy news week in civicness in Langley. First off, BC Hydro has preserved the passenger right on the Interurban alignment through Langley. Second, it seems that the 208th Street corridor and the Downtown Master Plan are causing a bit of a storm in the City. I’ll start off with the Downtown Master Plan. I’m a big supporter of downtown plan as it will help Langley City become more accessible for sustainable transportation. There is tons of underutilized, grayness in the core of the City that is screaming for new development. The site in question that has people upset is the Langley Prairie School site. Last year, the City demolished the heritage school that was on that site. Now they have put out a public offering for the site. I’m sure people still have the memories of last year's demolishing fresh in their minds. It would appear that the main concern is the perceived loss of “view” that comes with higher density developments. That is a valid concern and an issue that Vancouver has dealt with for some time. I also believe there is a bit of we-don’t-want-change-becauseness as well. The City's Spirit Square is the perfect example. Some people got very upset that there was going to be change at Douglas Park. After the square was built, people are happy. I think that once people start to see the benefit of living in a revitalized Downtown Langley, they will be more open to change. 208th Street is another issue. The City staff wanted to restrict left turn access from/to 208th Street at 46A Avenue and 208/Newlands Drive due to a high collision rate. This is now a political no-go, and it's back to the drawing board for City staff. One good thing about the 208th Street improvement will be the provisioning of proper bike lanes. I was busy at the Statistic Canada website pulling together stats about mode share for work/school journeys. I wanted to see the difference between the 2001 and 2006 census. I have tabulated the data for you, with a focus on South Fraser communities. I also put Vancouver and Burnaby in as a comparison for the South Fraser. I wanted to point out a few things. Click on the graphics to make them bigger! We all know that there is not enough public transit in the South Fraser, but over the last little while TransLink has improved service in some areas. You can see that all communities have seen gains in mode share. What is interest to see is the difference between the Township of Langley, which only saw a 1% gain, and the City of Langley which saw a 3.5% gain. This makes sense because the City of Langley has seen much more transit service improvements than the Township. Also, you can see that Abbotsford has seen virtually no change in transit mode share. This could be attributed to the lack of investment in transit service. Funny enough, it seems that the more transit service you provide, the more people will take it. It is encouraging to see that we are changing mode share, but I believe there is one area that needs major improvement. Cycling in the South of Fraser is almost non-existent as a mode of commuting. In fact it has gone down since 2001. You can see that places like Vancouver (that have invested in cycling infrastructure) are seeing people cycling more. In the South Fraser, cycling infrastructure is a patchwork of bike lanes that start and end almost at random. We can do much better to promote cycling in the South Fraser. The Township of Langley has the right idea with their cycling network that is starting to form in newer neighbourhoods. The big question is what happens if the measures where found not effective? What will the report say? This follow-up process will last until 2017. Anyway, the Corporation of Delta has a website that has a timeline of the SFPR project activities and the actions of the Inter-Agency Environmental Review Committee. Accord to a recent report from Delta, they have "concerns with the post-Environmental Assessment procedures have been previously documented by Council and conveyed to the Premier and Minister of Environment. These concerns included that the Environmental Assessment Office should be the lead on the Inter-Agency Environmental Review Committee and also that a community liaison committee, like the one set up for Deltaport Third Berth should be formed to review issues relating to construction and operation of SFPR. The Premier did respond recently advising that the Minister of Environment would be looking into this matter and providing a response to Delta." 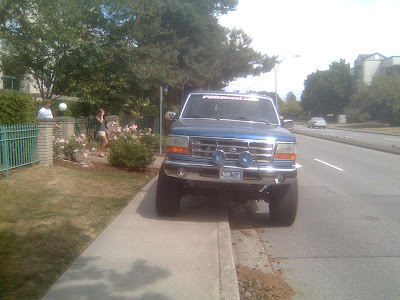 A week or so ago a fellow Vancouver blogger posted on horrible parking practices in Richmond. Not to be left out, Langley too has its share of people that have no respect of other road users. This picture was taken yesterday across the street from my condo. Happy Friday! It looks like people in Toronto will be getting new streetcars according to an article in DailyTech. We’ve been following the story about Toronto light rail future for some time. They now have the funding from all levels of government to start construction of the Toronto Transit City vision to see 120km of new light rail. One of the last remaining issues was finding money to replace their current, aging streetcars which they have apparently found... The federal government refused to fund 1/3 of there replacement cost outright. That is the current plan for the City of Toronto. The Toronto Transit Commission has just ordered 204 streetcars from Bombardier in the largest single order for light rail vehicles in the world. The contract is valued at $851 million CAD ($735 million USD, €523 Million). "The contract represents the largest single order ever for light rail vehicles worldwide and solidifies Bombardier's position as the world's leading provider of light rail technology," the company said in a statement. New subway lines are extremely expensive and can cost over $1 billion per kilometer to build. They also require high urban densities and heavy passenger volumes to be effective. Light rail lines are much cheaper to build and operate. They can carry higher volumes than buses, while creating virtually no pollution due to their electric propulsion. Light rail lines are usually built on their own right-of-way on street level, but can also be built underground in dense neighborhoods. Traffic demand forecasts for both the AM and PM peak periods indicate that in the peak direction, three lanes are required across the Pitt River beyond the implementation time frame of the Fraser River Crossing. As a minimum, three lanes would be required in the peak direction with only two lanes required in the opposing direction, therefore implying that a counterflow operation would need to be maintained. 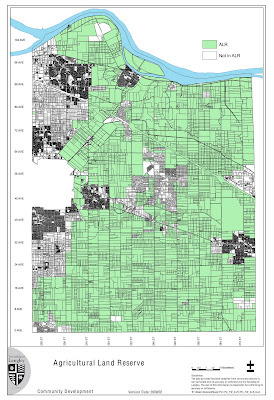 Traffic demand forecasts were generated for the 2011 planning horizon for the North Fraser Perimeter Road. These forecasts assume that the new Fraser River Crossing is constructed and tolls are imposed on this new crossing. So my question is why aren’t we tolling the bridge? The Gateway Program folk even admit that a bridge without a toll will become congested at a much faster rate than a tolled structure. To answer my own question on tolling, the Provincial government has a dusty, outdated policy that says tolls can only be used for new construction and when there is a free alternate route available. This policy should be looked at again, as it was probably put in place to calm people down when they first tolled the Coquihalla. Tolling is proven to help reduce demand on infrastructure. The revenue generated from the tolling should be used to maintain current transportation infrastructure (including transit) and building sustainable transportation options. I think that people would be willing to pay a toll if they knew that it would help make their travel time faster. The argument that "my taxes already pay for the highway" is not valid in this day and age. User-fees are nothing new to the province. Everything from Township of Langley fields to transit to MSP has a user-fee. People tend to respect a resource more when they have to pay for it directly. A forum, hosted by the Mayors' Council, comprised stakeholders including John Winter of the BC Chamber of Commerce, Dr. David Suzuki of the David Suzuki Foundation and Jim Sinclair of the BC Federation of Labour. Representative parties signed the Regional Transportation Accord calling on all three levels of government and TransLink to work together to find solutions to achieve adequate funding.